Not long ago, I realized that I was being cheap with myself over something pretty silly – tissues. I always bought the store brand, never the “Puffs Plus Lotion” or the “Kleenex Ultra Soft.” Allergies plague me almost year-round, so I use a lot of tissues. Six weeks ago, my mom stayed with me for a few days while she was recovering from hip surgery. She left behind a box of Puffs Plus Lotion when she returned to her third-floor condo. I felt like I hit the lottery – YAY! Soft tissues! The next time I went grocery shopping, I stocked up on the good, brand name, super soft tissues. My nose has never been happier! I’m telling you this “tale of the tissues” because many of us are being cheap with ourselves in some form or fashion. There is something we want that will add real value to our lives but we don’t allow ourselves to have it even though we can afford it! Maybe we’ve been brainwashed into believing that we can’t be financially healthy and enjoy our lives at the same time. Do feel like you should always buy things on sale, off the clearance rack, or with a coupon? Do you feel guilty if you don’t? There’s nothing wrong with scoring a great deal, BUT you’re not going to coupon your way to prosperity. When I’m coaching my clients, we focus on expanding income and redirecting spending to what’s most important to them. We don’t spend much time talking about couponing, discount shopping, and cutting expenses to the bone. That’s no way to live and most of my clients aren’t in a position that they need to. 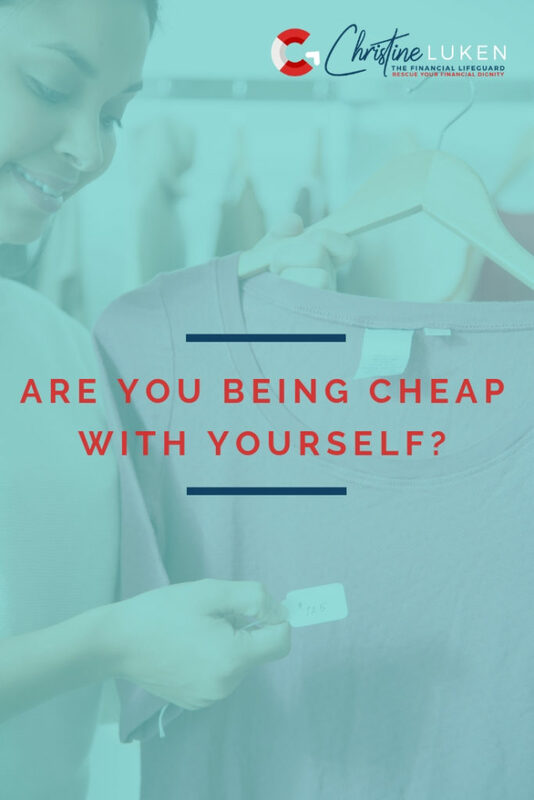 I want to know: In what area of your life are you being cheap with yourself? Is there something you’re putting off buying even though you can afford it (without going into debt)? Are you accepting a cheaper, less satisfying, substitute? I encourage you to have a more expansive money mindset. Not one that is focused on scrimping and scraping, lack, and barely getting by. You were made for more! More prosperity, more success, and more of the things that will enhance your life and help you achieve your goals. But first, you have to quit being cheap with yourself. Ready to invest in your Personalized Prosperity Plan? Here’s a link to my calendar so we can set up a time to CHAT.